Species functional behaviors amidst the food web, such as feeding ecology in ecosystems, are directly connected to their habitat preferences and use. In reef ecosystems, groupers and sea bass are considered key species, as top-down controllers, regulating the trophic levels on which they feed. Moreover, they are a diversified group of actinopterygian fishes, ranging from 7 to 250 cm of total length and inhabiting many types of reef habitats, from shallow waters up to 200 m deep. Due to the exceptional ecological and commercial importance of groupers and sea bass to the rocky reef systems of southwestern Atlantic and considering the small amount of information on their behavior and habitat use available for this particular region, three questions have emerged. First, how are the species spatially distributed considering the topography complexity of their environment? Second, do large Epinephelids and small Serranids have the same use of the water column, when foraging (e.g., position related to the substrate)? Third, do marine protected areas influence the distributional patterns of both families? To answer these questions, we assessed the spatial distribution and habitat use of two dominant species of groupers (Epinephelus marginatus, Mycteroperca acutirostris) and three species of sea bass (Diplectrum radiale and Serranus flaviventris and S. baldwini), using underwater visual census at Santa Catarina State, southern Brazil, during the austral summers of 2010 and 2011. All of the five sympatric species studied are directly associated with specific topographic characteristics that may be related to shelter as well as to reproduction and feeding. Except for M. acutirostris, which was mainly recorded foraging in the water column, all the remaining species are benthic dwellers. 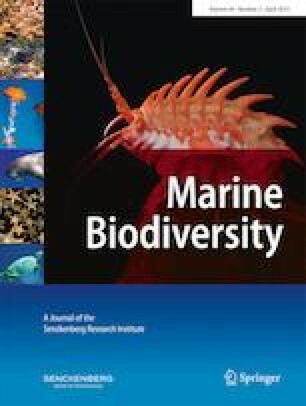 Significant evidences of effectiveness advocate that Arvoredo Marine Biological Reserve has critical importance as a refuge for heavily targeted reef species in southern Brazil, such as E. marginatus and M. acutirostris. The establishment of more protected marine areas that encompass the nursery areas near AR, along with proper enforcement, is critical to the protection of endangered and vulnerable marine species. The present work has contributed to the knowledge of habitat use and partitioning of some key reef fishes, especially target species, which is critical to effective conservation measures, including the design and management of MPAs. The online version of this article ( https://doi.org/10.1007/s12526-018-0893-6) contains supplementary material, which is available to authorized users. We thank the research teams from the Ecology and Hydrology Laboratories, University of Murcia, Spain; and the Marine Macroecology and Biogeography Lab, Universidade Federal de Santa Catarina, Brazil. We thank Projeto MAArE – Portal de Monitoramento Marinho (http://maare.skymarket.com.br) (via Barbara Segal, Ana Flora de Oliveira, Edson Faria Júnior, Marcio Soldateli), and Project Thermal tolerance, species distribution and the impact of climate warming (PI: Sergio Floeter, CNPq 402053/2012-5) for the temperature data. We thank Tatiana M. Pereira, LabPEIXE - Universidade de Vila Velha, for comments. Financial support from the Bank Bilbao Vizcaya (Fundación BBVA), Spain, and Coordenação de Aprimoramento Pessoal de Nível Superior - CAPES - Brazil has allowed this work to be carried out. This study was funded by Bank Bilbao Vizcaya (Fundación BBVA), Spain: 5ª Convocatoria de Ayudas a la investigación en Ecología y Biología de la Conservación (Proyecto Evaluación de la dinámica poblacional y la movilidad para la conservación de los meros: Comparación entre reservas marinas de interés pesquero y reservas biológicas, P.I. García Charton, José Antonio, Universidad de Murcia, Q-3018001B), Coordenação de Aprimoramento Pessoal de Nível Superior - CAPES - Brazil and FAPESP grant 98/10340-1, 05/51855-0, 05/51856-6, and 2008/02861-5 to FZG. All necessary permits for sampling and observational field studies have been obtained by the authors from the competent authorities.